Here's a little about this course. In the Lesson, students will use Properties of Equality to solve one-step equations. In the Lesson, students will solve multi-step equations by using inverse operations to isolate the variable. In the Lesson, students will solve equations with variables on both sides by using Properties of Equality and collecting variable terms on one side. The equations could have one solution, no solution, or infinitely many solutions. In the Lesson, students will rewrite literal equations when asked to solve for a specific variable in a formula. In the Lesson, students will use the definition of congruent figures to determine whether two figures (polygons) are congruent. In the Lesson, students will use their visual skills to draw translations in the coordinate plane. In the Lesson, students will use their visual skills to draw reflections in the coordinate plane. In the Lesson, students will use their visual skills to draw rotations in the coordinate plane. In the Lesson, students will use the formal definition of similar figures. In the Lesson, students will use the stated relationships to solve problems. In the Lesson, students will identify dilations and use scale factors to enlarge and reduce polygons in the coordinate plane. In the Lesson, students will find the measures of many types of angles, all formed when parallel lines are cut by a transversal. In the Lesson, students will continue to find the measures of many types of angles, all formed when parallel lines are cut by a transversal. In the Lesson, students will use a formula to find the sums of interior and exterior angle measures of a polygon. In the Lesson, students will find slopes of lines from graphs and tables. In the Lesson, students will write and graph proportional relationships. In the Lesson, students will graph equations in slope-intercept form. In the Lesson, students will graph equations written in standard form. In the Lesson, students will write an equation of a line using the slope and y-intercept. In the Lesson, students will write an equation of a line given the slope and a point. In the Lesson, students will solve systems of linear equations by graphing. In the Lesson, students will solve systems of linear equations by substitution. In the Lesson, students will solve systems of linear equations by elimination. In the Lesson, students will solve special systems of linear equations. Download the exam (print if you wish) and input your answers into the digital format online. The sytem will auto-grade your responses. In the Lesson, students will use ordered pairs and mapping diagrams to display functions. In the Lesson, students will represent functions by writing equations in two variables, using input-output tables, and using graphs. In the Lesson, students will compare linear and nonlinear functions. In the Lesson, students will find square roots and evaluate expressions involving square roots. In the Lesson, students will find cube roots and evaluate expressions involving cube roots. In the Lesson, students will use the Pythagorean Theorem to find missing side lengths of right triangles. In the Lesson, students will approximate square roots working with known perfect squares. In the Lesson, students will use the converse of the Pythagorean Theorem and the distance formula. In the Lesson, students will find volumes of spheres. Students will learn what happens to the surface areas and volumes of solids when the dimensions are multiplied by a factor of k.
In the Lesson, students will construct scatter plots and identify relationships between the two data sets. In the Lesson, students will draw the line of fit for a scatter plot and analyze the equation of the line. In the Lesson, students will construct two-way tables and identify relationships between categories of a two-way table. In the Lesson, students will choose and construct an appropriate data display. In the Lesson, students will write expressions involving exponents and evaluate powers. In the Lesson, students will use the Product of Powers Property, the Power of a Power Property, and the Power of a Product Property to simplify expressions. In the Lesson, students will use the Quotient of Powers Property to simplify expressions. In the Lesson, students will use the definitions of zero and negative exponents to evaluate and simplify expressions. In the Lesson, students will read numbers in scientific notation and write them in standard form. This 90 question Final Exam covers units 6-10. Download the document (print if you wish) and input your answers to each question online. The system will auto-grade your responses. Do your best and good luck! This course covers the Common Core State Standards geared towards a regular prealgebra classroom. 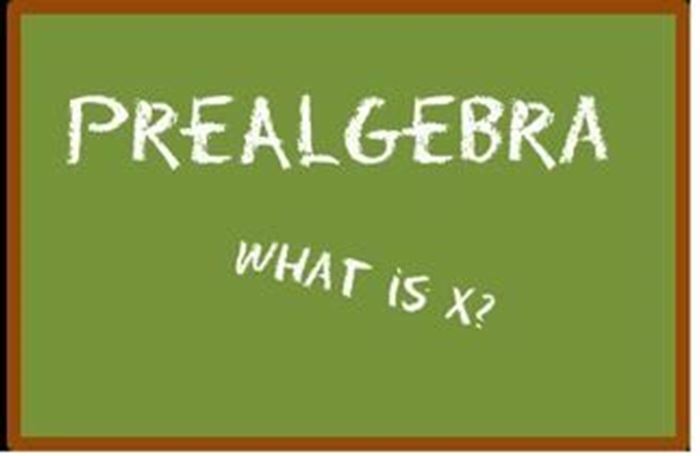 This course is designed to prepare students for Algebra 1 but can also be used as a tool to help students keep their pre-algebra skills sharp through the long summer breaks. My hope is that students who take this course leave with 1) a better appreciation and enjoyment of math 2) stronger critical thinking and reasoning skills in math and 3) a solid foundation to catapult them to success in their future mathematics careers. Students taking this course should have succesfully completed the typical grade 7 concepts. There may be a few gaps depending on indivudual backgrounds but most concepts can be learned regardless through the explanations in these video lessons. Comparing Linear & Non-Linear Functions. Thanks for taking my course. I'm excited to get started with you! Education: BA in Middle Childhood Mat & Science Education-Cedarville University 2006. MA in Teacher Leadership from Cedarville University 2010. Interests: God, Family, Education, Sports, Being outside. Skills: Handyman, technology, coach cross country & Track. Associations: State Licensed Teacher, Ohio West District Teacher of the year recipient. Click the "txt" file to the right to select which lesson you want to see the solutions for. Note: Some lessons do not have answer keys provided for parents, however, all lessons have a worked-out-solutions video that accompanies each practice sheet that students can view.